How best can you ruin a pleasant morning’s jog in the bush, aside from incurring an injury? Well, for me, you post this sign on the door of the little outhouse alongside the foot trail: “Please keep this door shut unless you want to meet the 1.5 metre python”. Boom. Done. My petit exertions in the gorgeous autumn sun suddenly took a sinister turn. A 1.5-metre python is in fact not a very big python. True, but it is a snake, and not just a garden variety snake either – a snake as long as my own person, a python nogal. Pythons are not to be sneezed at. How can you possibly live in South Africa, go for walks in the bush, and not expect there to be snakes? 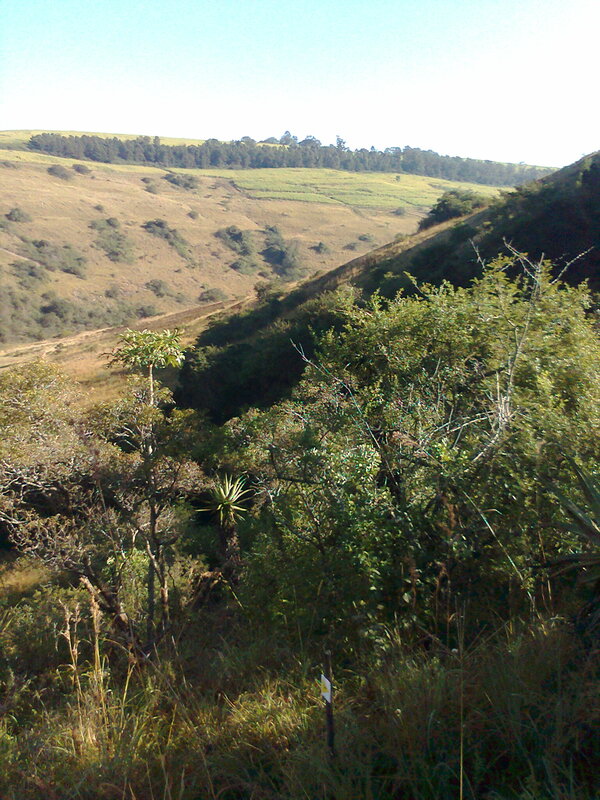 Gwahumbe, just over an hour from where I live. It’s pretty great to be able to so easily visit such places. The photos were taken on my antiquated little cell phone, so the quality is pretty shoddy. True again, but there is world of difference between knowing there are snakes out there and studiously not thinking about it (otherwise you might never step out your front door) and having a black-and-white poster serve as proof that a particular python has caused enough consternation in that vicinity to warrant the time and effort that goes into commissioning a proper, durable, printershop-quality sign. A world of difference. I had been out on the trail for about 20 minutes, and had not thought about snakes even once. But I saw that sign and I could no longer live in my bubble. From then on I had to assume that every turn in the path would cast me upon a thick twist of slimy snake, or that every tree branch I took hold of to help me scale the steep hillside would become a coil around my wrist. I would like to add here that the door on which this warning was mounted was NOT closed, but was in fact very much ajar. (A plague on your house, whoever you are, with your satisfied bladder and scant concern for those who come after you!) So, after a brief spell in which I jogged along happily by myself – thinking what generous landscapes Africa has to offer, how very nice it is to be outside inhaling all that fresh air, and cathartically singing Kree Harrison’s “All Cried Out” as heard last night on American Idol – I was faced with a choice: turn back from whence I came and retrace my steps (which I hate to do, because: boring! ), or plunge on up into the hillside thicket that is known to be the haunting grounds of one 1.5-metre-long snake. Snakes usually hear you coming and move away. True, true, true, and I know this, so I made as much noise as possible. I even clapped my hands every few metres just for good measure and so the cyclists on the hill above me would think me a weird walking, clapping loner. But, I wish to add this: sometimes the word “usually” is of no comfort at all. All I knew was that I might see a python – BLEUGH! Enough said. However, as much as I do hate snakes – and I really do hate them (there can be no overstressing this) – I am pleased to say it didn’t really mar my whole morning. It just ruined a few paranoia-filled minutes. 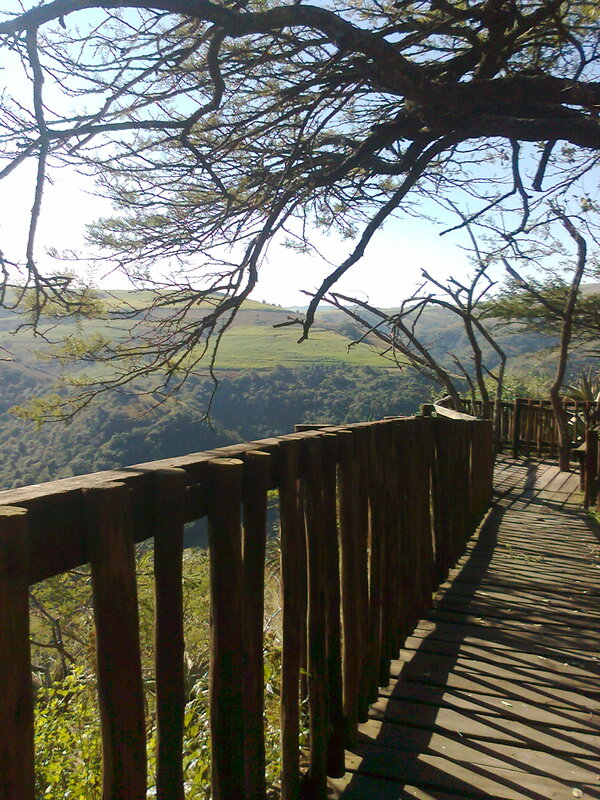 But it was clearly preordained to be a good morning, and so it was; I was at Gwahumbe Game Reserve, and I was there on a beautiful day in May, my favourite month of the whole year because the days are as crisp and sunny and perfect as they come. 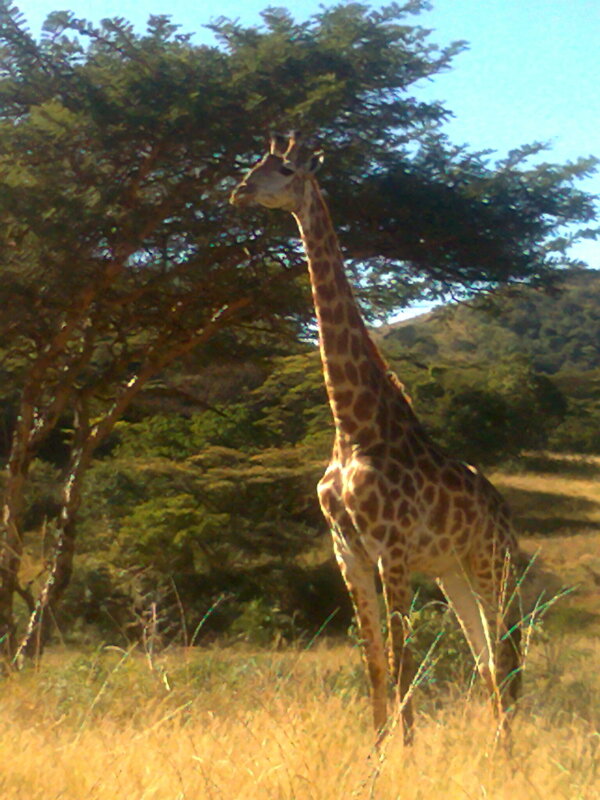 Giraffe apparently have as many neck vertebrae as humans. Just FYI. After my walk, I joined my dad and a bunch of other Honda CR-V owners who had gathered at Gwahumbe for the purpose of attending a morning lecture on the ins and outs of their vehicles followed by a guided game drive during which everyone could test the mettle of their 4x4s and ask any practical advice if need be. I was literally just along for the ride. So mid-morning (post jog and post lecture) I rejoined the group and a convoy of about 10 CR-Vs wound its bumpy way down into the valley, and I sat as a bobble-headed passenger, game spotting. At the river, everyone turned off their engines and piled out for a let’s-gather-round-an-open-bonnet sort of lesson; I listened for about 10 minutes before I became bored and drifted away to nap in the car, windows down, gentle breeze wafting over me, thoughts of the giraffes I’d just spotted playing through my head … namely, do giraffe ever, ever cease to look so terribly odd? Not a very pleasant surprise, indeed!